Gelsenkirchen - Borussia Dortmund's 2-1 defeat to FC Schalke 04 on Saturday - their second Revierderby loss of the season - may not be enough to represent a shift in the Ruhr area balance of power just yet, but make no mistake: the defending Bundesliga champions are seething. The fact that three more points went begging was more of an after-thought in light of their defeat against their fierce local rivlas. Anyone who has lost out to a sibling for the last slice of cake or the chance to sit in the front seat will understand the simmering sense of injustice and inner fury the Dortmund camp is now experiencing. The fact that the Yellow-Blacks remain in second place, seven points ahead of their victors, is, for now, scant consolation. Dortmund are a whopping 20 points behind leaders FC Bayern and even the most optimistic aficionado will recognise that barring a Munich meltdown in the season finale, with only 27 points still up for grabs, the Bundesliga shield will be residing in Bavaria next term. As if that were not enough, Schalke's victory pulled the Royal Blues level in the overall balance of Bundesliga Revierderbies, with each side having now won 29 times from 82 encounters, with 24 draws. "We can't change that we were bad in the first half," a despondent Lukasz Piszczek said after the final whistle. "Unfortunately we couldn't come back and that hurts. We hope to win the next derby though." Dortmund coach Jürgen Klopp was equally downbeat. "I have to congratulate Schalke for a deserved victory," he began, before venting his frustration: "It feels like such an unnecessary defeat, though, because we had some very good spells too. In the first half we made some tactical mistakes when switching from attack to defence. We allowed them to put in crosses they should never have been able to." 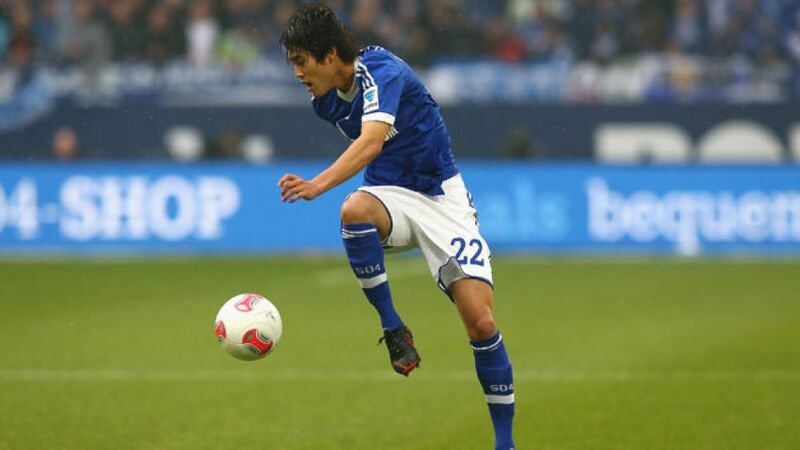 Indeed, two pinpoint Atsuto Uchida centres set up Julian Draxler and Klaas-Jan Huntelaar to give the hosts what proved to be an unassailable lead. Despite Dortmund subsequently throwing bodies forward, Robert Lewandowski's second half reply - the Pole's seventh strike in as many Bundesliga games - did not break the dam as hoped. "We just didn't make the most of our chances," said Klopp. "Schalke had more attempts on goal than we did [20 compared to 17]. Our second half was really good." With a successful championship defence seemingly impossible and Dortmund also eliminated from the DFB Cup, the team's progression to the quarter-finals of the continent's premier club tournament means Dortmund's eggs are all very much in one basket. And with Klopp's ambitious troops smarting from this latest setback, Europe had better beware of a BVB backlash.